Post warm-up drills, see Post play - Danny Manning. 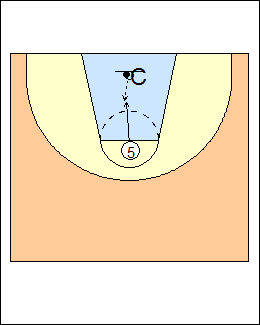 Jump-hook drill, every day, from 3 spots. 5 bounces the ball to himself, steps with his left foot inside the charge line (step across, not up), picks it up, chins it, plants the outside foot, the ball goes to the outside of his right ear, elevate up and shoot it outside of a telephone booth. 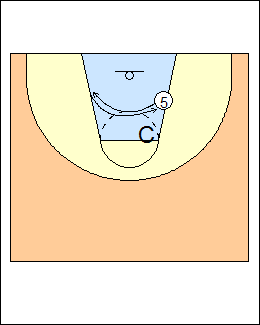 Repeat in the middle of the lane, then on the right, the last jump hook is off the glass. Renato Pasquali - coach bounce passes to 5, who catches with outside-inside footwork, repeat coming back, also taking about 4 jump hooks with the left hand. 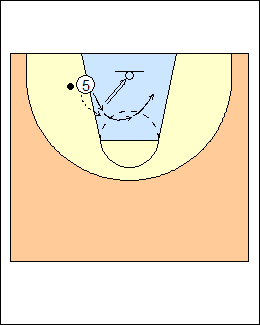 See Post play - Pasquali moves and shots. Come in from the foul line, catch a toss from coach, lay it in, backpedal, continue. Progression - coach tosses the ball high, jump to get it with two hands, come down then dunk or drop it over the rim. They do this with a medicine ball (also do standing core twists, sweeps, pivots, pass fakes and passes with a med ball). See Post play - Pasquali agility, Paul Mokeski drills. Facing the basket, chop your feet in an arc from one side to the other and back (attack the defender's top foot), repeat going faster, and with coach pushing you. Option - with high hands, hold a towel or broom stick.